Description: In the Fray collects David Gushee's most significant essays over twenty years as a Christian intellectual. Most of the essays were written in situations of ethical conflict on the highly contested ground of Christian public ethics. Topics addressed include torture, climate change, marriage and divorce, the treatment of gays and lesbians in the church, war, genocide, nuclear weapons, race, global poverty, faith and politics, Israel/Palestine, and even whether Christian ethics is a real academic discipline. Quite visible in the collection is Gushee's deep research interest in the Nazi era in Germany and how the churches fared in resisting Nazi intimidations and seductions and, finally, the Holocaust. All essays reflect the desire for a church that has learned the lessons of that period--a church with resistance to racism, militarism, nationalism, and other social-ideological toxins, and with the discernment and courage to resist these in favor of a courageous allegiance to the lordship of Christ at the time of testing. Considerable attention is directed to contesting some of the public ethics found in the author's own US evangelical Christian community. Concluding reflections on Gushee's ethical vision are offered in an illuminating essay by senior Christian ethicist Glen Harold Stassen. 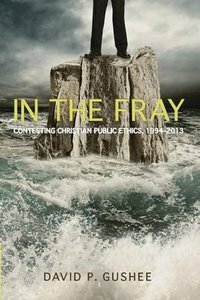 About "In the Fray: Contesting Christian Public Ethic 1994-2013"